Sensual, expressive and revealing, Head and Heart tells the story of two lovers and their escape from empty marriages into passionate fulfilment. 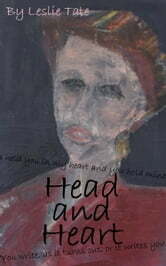 From nervous first meeting to deep involvement, exploring divorce, alopecia and the language of love, these poems will surprise, delight and challenge. Presented in themed sections with short, helpful introductions they offer a new take on boy meets girl. Enjoy them as original lyrics or an A-Z of modern love; learn how to stay in the bubble and keep the love light alive; share loves unseen presence in cities, galleries, parks, gardens and nature ─ or go with the poems to explore the raw, rich power of Eros in words, with expression, as song. Best selling Author and Poet, Leslie Tate, lives with his partner, novelist Sue Hampton, in Berkhamsted, near London, UK.